Manifolds are like the "heart" of a radiant floor system. Plumbing manifolds are that central place where water is distributed into smaller pipes and sent through the radiant heat system. Manifolds are used to distribute water in radiant, snow-melting, and hydronic applications. 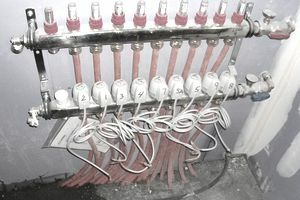 These centralized systems are made of adapters, end caps, and fittings that normally are designed or specified in customized manifolds depending on the intended application. They also have individual shut-off valves allowing to turn-off a single fixture or a specific conduit without affecting other areas of the building. The water valves should be identified to indicate which plumbing fixture is being controlled from that specific valve. A good manifold should be able to distribute water efficiently and economically when the PEX tubing has been sized properly. When the PEX tubing is designed properly, hot water will flow faster resulting in water and energy savings. Plumbing manifolds are manufactured in different sizes, the most common being between 3/8-inch and 1/2-inch PEX pipe. Additional models are also available up to a 12-branch manifold set that should be enough to cover an area of 2,500 square feet of floor. While products vary from one manufacturer to another, they normally include one supply side with adjustable flow meters and outlets for PEX tubing, a return side with balancing valves, and outlets for PEX tubing. Plumbing manifolds should also contain two drain-fill valves with temperature gauges, 3/4-inch garden hose connection, shut-off ball valves, and wall mounting brackets. All of these manifolds and their coverages will depend on the size of the PEX pipe used. For a typical slab heating system with 1/2-inch PEX spaced at 12-inch OC (on center) and 1,500 square feet of space, the project would require about 1,500 linear feet of PEX. Hot and cold water plumbing requires separate PEX plumbing manifolds. They are sized and selected based on the number of fixtures, as well as inlet and outlet pipe sizes. Remember, a radiant heat system includes not only a good PEX manifold system, it should also have the right cables, floor mat, fittings, thermostats, and the right PEX tubing.